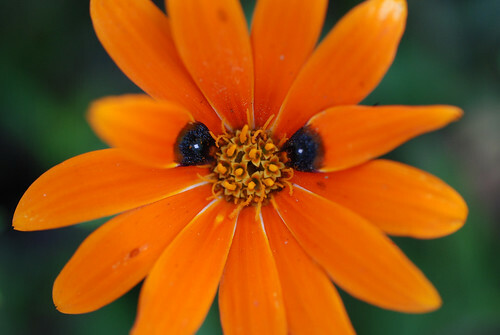 Pollinators to deceptive daisy: Fool me twice, shame on me « Nothing in Biology Makes Sense! To tackle the question of why some daisies are deceptive while others aren’t, Marinus de Jager and Allan Ellis—biologists in the Botany and Zoology Department of South Africa’s Stellenbosch University—examined the evolutionary history of the pollinating bee flies. de Jager and Ellis collected bee flies from across the range of G. diffusa, in populations representing all the major variations of the daisy’s floral patterns. They collected DNA sequence data from the sampled flies, and reconstructed the evolutionary relationships among them, so see whether bee flies from populations of deceptive daisies formed distinct genetic clusters. Such clustering would imply that the deceptive daisies are interacting with bee flies that differ in some way from the bee flies interacting with other floral patterns—and maybe that the flowers are adapted to the preferences of specific pollinator populations. This is what the genetics showed—sorta. Bee flies that used the three different deceptive forms of G. diffusa fell into separate genetic clusters within the species as a whole—but they’re closely related to bee fly populations that interact with non-deceptive daisys. That suggests the deceptive daisies could be specializing on distinct preferences within each cluster of pollinators, but it looks like the pollinators aren’t specilizing in return. The coauthors followed up this observation with a behavioral experiment, to see whether the deceptive floral forms really were specialized—that is, whether each floral pattern is uniquely good at attracting male bee flies of the clade associated with that pattern. 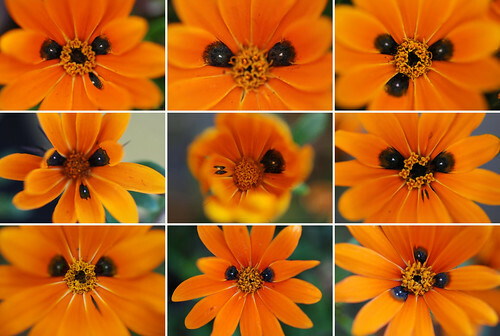 de Jager and Ellis captured male bee flies from populations with deceptive daisies and then presented them with either an array of flowers with the local pattern, or a different deceptive pattern. They observed the bee flies’ interactions with the flowers, noting whether they went looking for nectar or tried to court the spots on the petals. Would the bee flies be more easily fooled by flowers from their home population? A collage of deception. Photo by Flickr/thehumofbees. Nope. Regardless of the bee flies’ population of origin, they were more likely to try to mate with one deceptive pattern—a three-spotted version—than the other. This was even the case when de Jager and Ellis tried the test with bee flies from a third population that doesn’t encounter any form of G. diffusa. So much for locally adapted deception! What’s more, the flies wised up over the course of multiple trials. When de Jager and Ellis compared observations of bee flies that had never encountered a particular deceptive petal pattern before to bee flies that had tried (and, obviously, failed) to mate with the form earlier, they found that attempted matings were significantly less common. So what’s going on here? It may be that sexual deception by G. diffusa isn’t so much a question of matching local pollinators’ tastes, as it is an arms race to keep decieving pollinators—and some of the decpetive daisy populations have evolved stronger deception than others. This is precisely what the authors suggest; and they note that, since the daisy doesn’t disperse very far, it’s possible that different local populations are out of sync in the race to fool their pollinators. Jager, M. & Ellis, A. 2013. The influence of pollinator phylogeography and mate preference on floral divergence in a sexually deceptive daisy. Evolution doi: 10.1111/evo.12070. This entry was posted in coevolution, phylogenetics, pollination and tagged bee fly, Gorteria diffusa, sexual deception. I suppose this could be akin to human male sexual preference. For instance, some men prefer women with specific features like red hair or tall women. My question is did it start as a specific genetic marker or was it the continued interaction? Environment vs. Heredity.